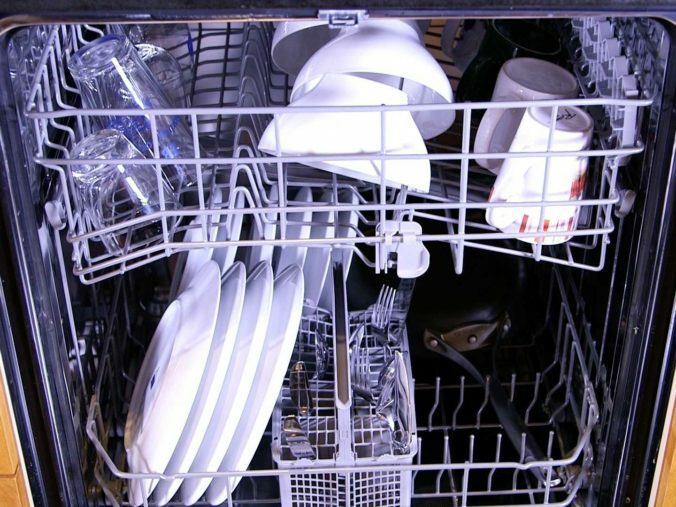 If your dishes come out of the dishwasher dirty, you might be tempted to rinse them before loading. But that’s old school and completely unnecessary with modern dishwashers. If your dishes are dirty, the problem could be that you’re overloading the dishwasher or loading it incorrectly. The key is to allow room for water to flow around the dishes and to not block the streams of water coming from the dishwasher’s spray arms. In this video, we show you how to load dishes so they get clean and aren’t damaged. And we’ll tell you what dishes you should never wash in a dishwasher and why. When loading your dishwasher, make sure the dirtiest part of the dish faces down so it gets direct spray from the spray arms. Place dishes with concave surfaces—like the bottoms of coffee mugs—at an angle on the dishrack to allow water to drain easier and improve drying. Always check that all spray arms spin freely before you start the dishwasher cycle. Remove labels from jars and bottles before loading in the dishwasher, or hand wash these items because the labels can fall off during washing, clogging the screens and pumps inside the dishwasher. Now, let’s talk about loading the different dishracks. The top rack is best suited for cups, glasses and lightweight plastic items. Place cups and glasses in the rows between tines—not over them, which can cause glasses to break. Put all your plastic dishes and storage containers on the upper rack—some plastics can melt if they’re too close to the heating element at the bottom of the dishwasher tub. Wedge the lids of storage containers between the tines and a glass to prevent the lids from coming loose and falling to the bottom of the tub. Or, hold lids or larger plastic items such as cups, bowls or storage containers, in place during washing. These clips fit the tines on most dishwasher model, regardless of brand. Order plenty of clips and use them to keep all your plastic items in place. Larger cooking utensils also should go on the upper rack, with spoons facing down so they don’t collect water. The bottom dishrack is best for plates, pots, pans and casserole dishes. Glasses and mugs that don’t fit in the top rack also should go here. Load plates with the dirty side facing the center, with enough room between each plate to let water reach both sides. Angle pots, pans and casserole dishes with the dirty surface facing down. If your dishwasher is a Kenmore with TurboZone spray jets, face heavily soiled dishes toward the TurboZone jets and select the TurboZone option for the cycle. You can load bowls in either rack, but you usually need to load larger mixing or serving bowls in the bottom rack if they’re too big for the top rack. Load taller items like cookie sheets on the outer edges of the bottom rack, making sure not to block the soap dispenser. If a cookie sheet or other item is too tall, see if you can raise the upper rack using the buttons or knobs on the side of the rack. If all else fails, you can release the rail clips and pull the upper dishrack completely out to wash multiple tall items in the lower dishrack. The silverware basket often fits in or on the bottom dishrack but it may reside in the top rack on some models. Use the slots in the covers to keep your silverware separated for best cleaning. Load knives and sharp utensils such as skewers into the slots facing down and all other items facing up. If your silverware doesn’t fit into the slots, flip the covers up and mix silverware types to keep them separated. Alternate the direction of spoon handles up and down so that spoons don’t nest together with other spoons—the same goes for forks. Load all knives and sharp objects with the blades and points facing down.